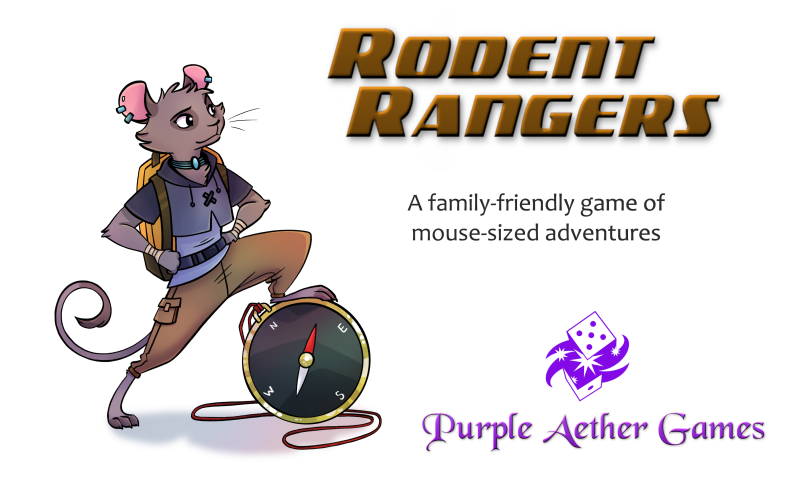 I'm new to the forums, but was invited from over on Mastodon to share my project with you: a new tabletop RPG called Rodent Rangers! 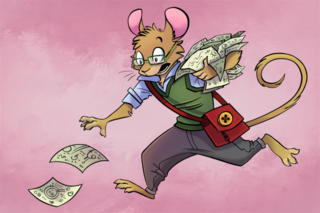 Today marks the launch of the Kickstarter campaign for this RPG, which is inspired by old-school cartoons about mice living under the noses of oblivious humans: The Rescuers, An American Tail, The Great Mouse Detective, and so on. 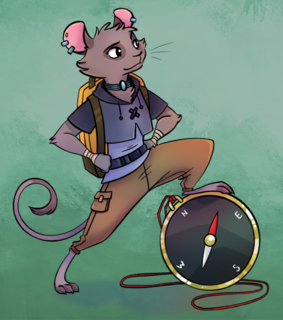 Rodent Rangers brings this concept into the modern world and puts you in the shoes of a critter working for an international organization of mice (and other small creatures) who send agents out on missions to help those in need. Have a look at the project HERE and feel free to ask me any questions. Thanks! Welcome to Exilian! I'm the executive admin (and currently also the chair) so do drop me a message if there's anything you want to ask about the site (or shout at our masto account and whoever's manning that will help you out!). This looks a fun project, and the idea of a family friendly low-combat RPG of this kind is definitely quite appealing. A couple of questions: are the dice required a full polyhedral set? Also, whilst you've said that the game doesn't have dedicated mechanics for combat, what specific areas does it focus on/what mechanics does it have that specifically tie into this setting? Regarding the dice, technically the d20 isn't needed (unless something changes in development), but the typical dice from d4-d12 are all in play. The core mechanics are basically skill checks, determining the success or failure of whatever it is you're trying to do. It's worth noting that the skill list includes things like "Scamper", which is used to do stuff like scurry across a busy street without getting stepped on, or otherwise use your mousey agility to get around. There is also a friendship die that you can use when helping a friend if they're using a skill you're not very good with, thereby encouraging teamwork because it helps compensate for your individual weaknesses. It's possible that additional setting/theme reinforcement could be added in development, but it will have to compete with a goal of simplicity and ease of learning; even so, I'm optimistic about landing in a sweet spot there. Feel free to drop me more questions! EDIT: Another good example of a setting-specific skill is Big Machines, which you use when you need to operate human-sized contraptions like keyboards or cars. 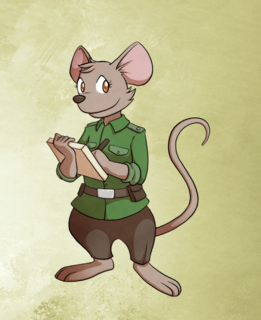 Further question: are all the characters mice, and are they all the same species of mouse? Mice are the default, but other small critters are possibilities as well. Basically as long as you fit the premise of the game, you're good to go. Something like a bear couldn't really be part of the society of critters that lives in the margins of human society unnoticed, so that wouldn't work, but pretty much any sort of small rodent, or even maybe certain birds or reptiles of a small enough size could be playable. Meet Meredith Quickfoot, known as "Officer Quickfoot" to her field agent subordinates like yourself. But don't let her decorum fool you: she's always looking out for her agents, and believes in your ability to get the job done! Do you have a website as well as the KS page, out of interest? I have a modest company website for Purple Aether Games, and then I also have my Patreon page. Meet the nefarious Rupert Silverclaw. His every move is motivated by greed and vanity. Whether he's stealing human artifacts or coercing craftsmice to create small replicas, Silverclaw is ever a thorn in your side. Last but not least, meet Nico Greywhisker, one of the most accomplished team leaders of the #RodentRangers. They're clever, brave, and earned their reputation for always getting the job done. When the going gets tough, the tough look to Nico. 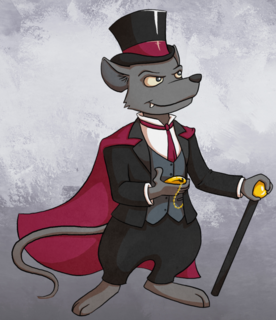 I like all the character mice The almost vampiric look on Silverclaw is fun - it'd be good to see a few more villains really, I suspect for this sort of game one of the challenges for DMs will be working out good, interesting villains who will have plots the players can foil without ending up in fight scenes. That might be less trouble than you think! While games like D&D have taught players (through endless combats) that every adventure is driven by a villain, Rodent Rangers' focus on an organization of helpers means that your adventure could be about evacuating civilians in a flood zone, or doing a search and rescue operation, any number of other things that don't require the involvement (or even existence!) of a villain. In fact, learning how to play out this sort of variety can make us better players of those other games as well.